After a week, the Los Angeles teachers strike is finally over. Union teachers approved a new deal and are going back to class Wednesday morning. Darsha Phillips reports for NBC4 News at 11 p.m. on Jan. 22, 2019. Tens of thousands of Los Angeles teachers returned to work Wednesday after voting to ratify a contract deal between their union and school officials, ending a six-day strike for the nation's second-largest district. Teachers and administrators greeted students with smiles, hugs and high-fives at Evelyn Thurman Gratts Elementary School. At Liggett Street Elementary School in Panorama City, there were even happy dances and cheers. "I voted `yes,' to approve," said second-grade teacher Wendy Perez. 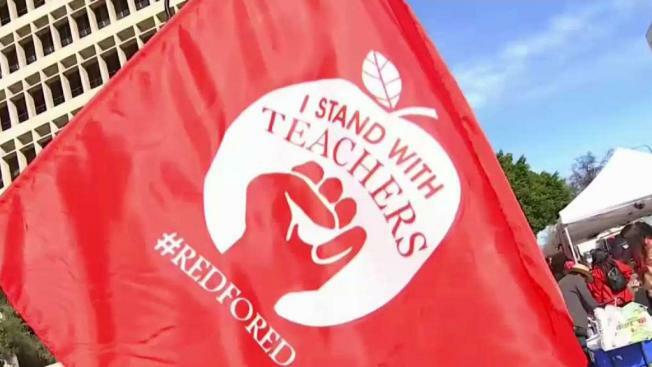 "I think the union negotiated in good faith, and I'd like to believe the district did too." "A vast supermajority are voting `yes'...therefore, ending the strike and heading back to schools tomorrow," he said. The new contract also eliminates a longstanding clause that gave the district authority over class sizes, officials said. Many schools will see a class size reduction of about four students in three years -- though 90 high-needs campuses will see six fewer students per class during that time. Those reductions were the main reason teacher Charles Pak voted to ratify -- but he said he was happy with the deal as a whole. "They're bored," he said of his 12th grade pupils. "Going back is going to be a big transition for everyone-- students, administrators, teachers."